There’s a little game I refuse to play. It’s called, “You can’t be friends with me if you’re friends with [fill in the blank]!” My stock answer to that is, “Fine, I’m sorry you feel that way. I guess we can’t be friends.” I don’t care if the person saying it is my best friend at the time, and [fill in the blank] is someone I hardly know. I also learned, back in grade school, not to judge someone based on others’ opinions. Oh, granted, others opinions hold some sway; I may be more cautious in getting to know someone if I’ve been given specific reasons to be, or I may be more open if people I trust and respect speak highly of the person. I can also be persuaded by facts – like rap sheets. But opinions and hearsay have no power, and it’s always wise to consider the source of your information or your feelings about something, before acting on it. One Halloween, my friends and I dressed up and met on the road to go trick-or-treating in the neighborhood. It was a small, close-knit village; my mom had grown up there, too, and many of my friends were children of her school friends. None of us could make a move without it getting back to our parents, so we were all pretty well behaved. And the neighborhood was safe; we were allowed to roam, mostly unsupervised, for several blocks at night, ringing doorbells and begging for candy, provided we only went to houses that had their porch lights on. Just around the corner from my house, there was an older wooden home set back from the road, almost within reach of the railroad tracks. I’d never been there before, on Halloween, but the light was on so I started up the sidewalk. My best friend, Mary, and her sister, Val, stopped me. I thought this was the stupidest thing I’d ever heard, but they were quite serious, judging by their wide eyes and pale faces. They tugged at my sleeve and tried to drag me away from the house. “The light’s on,” I said. I pulled free and marched right up to the front door. Val hung back, on the road, ready to run for help. Mary timidly joined me. I rang the bell. The door opened, and the woman who answered it peered out at us through Coke-bottle glasses that made her eyes seem three times larger than normal. “Hello,” she said. She looked like somebody’s grandma. “Trick or treat!” I said. “Oh, do come in. You’re the first trick-or-treaters I’ve had all night. I was afraid no one was coming!” Her dog, a tiny little bundle of energy and enthusiasm, pressed his nose to the door and wagged his tail. “I’m Mrs. Morgan. And you are…?” She opened the door and we introduced ourselves. We stepped into a well-lighted foyer, where card tables were covered with little cups full of apple cider and plastic bags filled with homemade cookies. There were enough treats, there, for all the neighborhood kids. Mary and I looked at each other. How could we tell this sweet old lady that the other children wouldn’t be coming? That the word on the street was, she was a mean old hag who liked to shoot kids and feed their bones to her dog? I bent down to pet the vicious mutt. He licked my hand. We couldn’t do it. We drank some cider, took a bag or two of cookies, and told Mrs. Morgan we had to go – but that we’d be back. After knocking some sense into Val and goading her into walking up to Mrs. Morgan’s house for cookies, herself, the three of us made the rounds and told everyone that they’d better go to the “witch’s house” or be branded chickens and idiots for life. We showed them the cookies they’d be missing if they didn’t. We told them all about the nice old lady and her yappy little furball “guard dog.” I think we made her night. Mary and I became frequent visitors at Mrs. Morgan’s house after that, bringing her flowers from our gardens: bright yellow branches of forsythia, fragrant purple lilacs, red and pink tulips, and the occasional sticky, ant-covered peony bouquet. She always seemed delighted to see us, and spent hours telling us about herself, her family, her dog, and the history of the little town we were growing up in. She had an old-fashioned crank telephone and lots of antiques. Her house was one of the original resort homes back around the turn of the century, when the whole village was a resort and amusement park. I finally confessed to my mom that I had befriended the woman everyone had said was a witch, despite worrying a little that my mom would be mad I’d spent so much time talking to a “stranger.” She laughed, and told me she knew Mrs. Morgan – who, Mom said, seemed old back when she was a kid. The kids had called Mrs. Morgan a witch back then, too, and Mom was glad I’d discovered the truth for myself. Each year, on the last day of school, we were told who our teacher would be the following year. 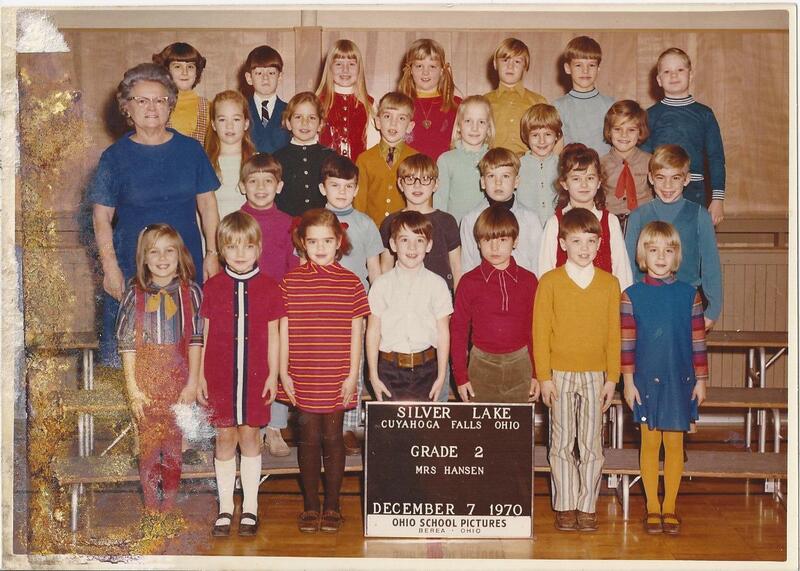 I was delighted to be moving on to Second Grade, but terrified by the news that my teacher would be Mrs. Hansen. I tried not to spend my summer worrying about it. In fact, I pretty much forgot about it until the first day of school. I went to class wary. But the blue-haired old lady known as Mrs. Hansen didn’t seem all that scary. She wasn’t particularly mean; she simply laid out the rules and expected us to follow them. But she smiled, too. She might be okay. A few weeks went by, and I don’t remember much about them. They were unremarkable. Mrs. Hansen was just a teacher, like all the others, only older than most I’d had. Probably eighty, at least. And she had that funny, blue, curly hair. One day, she gave us a worksheet. I don’t know if I was bored or what, but I didn’t bother to fill in any of the blanks. I hadn’t been paying close attention, and didn’t realize we’d be required to turn it in – or that we’d be getting a real grade on it. I turned it in blank. And I got my first “F” the next day. “F”? Oh, my God. My parents would be furious. I was horrified. Little Miss Smartypants got an “F.” I grabbed my #2 pencil and proceeded to grind “I hate Hansen” into the margins of my paper, while my classmates corrected their errors. Apparently, I’d missed the part about correcting errors and turning the paper in again. I was screwed. I didn’t know the word “screwed” back then, but I understood the concept, and knew I was screwed beyond redemption. I frantically tried to erase the hateful words. Not because I didn’t mean them, but because now I’d added insult to “F” and that would surely mean a call home to my parents. They would not be amused. Have you ever tried to erase ground-in pencil marks from manilla paper? Hmm? It can’t be done. I turned the paper in. I don’t remember breathing, after that. The phone became a deadly snake, coiled and ready to strike. My adoring parents were going to kill me for this one. She was sorry? Oh, God, no one could be sorrier than I was at that very moment. What did Mrs. Hansen have to be sorry for? Then the worst happened. Those of us who had failed to raise our letter grade would have to come up to her desk for a private chat. I stood in line. My feet were made of lead. I wished God would just strike me dead. And then it was my turn. Mrs. Hansen stood up. Our eyes met. And she did the strangest thing: she hugged me. “I’m so sorry,” she said. “So am I!” I said. We both cried. The rest of the kids thought we were crazy, but in that fraction of a second, I had found my favorite teacher ever. Mrs. Hansen never did call my parents. About a year later, my grandparents were throwing a lawn party some twenty miles away, and who should be there but Mrs. Hansen and her husband. I was still afraid she might call – what teacher wouldn’t? – but she hadn’t. I didn’t like her being there at that party at all. “What is she doing here?” I asked my mom. Uh, no, Mom…you omitted that little detail. I kept in touch with Mrs. Hansen until the day she died, sometime when I was twenty-one. Her son wrote to me and told me how much my friendship and letters had meant to her over the years, but words were inadequate to describe how vitally important her teaching and friendship had been to me over the years. ← Previous Previous post: What is #blogcrawl? Facts like rap sheets matter but opinion and hearsay should hold no power. Love that. It’s sometimes bewildering how some friends take it as an affront if we talk to persons they have an intense dislike to. We don’t mean to spite our friends, do we? This is true as well in social media. Jerks cautioning me not to follow the Mrs Morgans they hated. Well, now you see how I handle them. Don’t confuse the jerks who refuse to be friends with you if you talk with Person A with the well meaning friends who only urge caution, because they’ve been burned by Person A. 2 great stories for the price of one. If true they should go into a book. One of those “How to Win Friends and Influence People” types. Both are absolutely true, Pete. You can see Mrs. Hansen in the photo. And me. Mrs. Morgan lived just around the corner from me. Unfortunately, I have no pictures of her. Then, we await the book: “The Wisdom and Stories of Holly”. You already have a certain amount of it written, scattered around. Maybe one day. I don’t feel old enough to be that wise, yet – just old enough to know how much I don’t know. HollyJahangiri recently posted…#blogcrawl Penny for Your Thoughts? Great blog entry! I really love this one, and it’s so true! People say lots of things, and very little of it actually means anything at all. This is truly a wonderful post with so many lessons to be learned! I remember having similar experiences. Luckily, my mother chose to teach lessons much the same way yours did. I made some great friends with some unlikely people along the way! Holly, great stories. You really took me back to those days in the Village. Yeah, I still think of Ms Hansen as The Witch, I didn’t have her to learn the truth. Glad you did, and that you shared it. Those are great lessons. It’s amazing how many adults forget these lessons and make determinations as to who we’re allowed to be friends with if we’re their friend. I’m like you, I never took what someone else said for granted. For the most part I found people were incorrect, although every once in awhile they were absolutely on the mark. I have my own scale for judging people and it will always be my own decision. That’s very true, Mitch, and I should clarify – I don’t object to the warning, by a friend, just a demand to choose between friends on their say-so. Because it also implies a lack of faith in me – that I could keep a firewall between them and not gossip. It implies that they demand loyalty as if by the right of kings, rather than accept it as a given between friends. I may end up losing two friends, if the one demanding it was right about the other. But I think I can live with that.